Everything’s Age Appropriate – Hi Blog! I'm Dad. Making an Amazon wishlist for my daughter is easy. I simply ask, “What do you want on your wishlist?” What follows is a torrential downpour of overly specific and expensive toys. All it takes is one question on my part and within five minutes, she’s named more potential gifts than I ever thought existed. It’s not so easy when doing a list for my son. Being non-verbal, Lucas can’t tell me what to add. All I’m left with is a guessing game based on his current tastes and, at least for the first few years, it was a game I almost always lost. Now it’s just a game that I usually lose. He’s the walking embodiment of “hard to shop for”. Lucas’s tastes in entertainment aren’t the same as most six year olds. 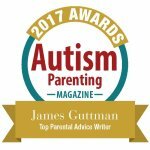 As most parents to a child with autism can tell you, the choices he makes are based on his own preferences with very few influences from the outside. He likes what he likes. Peer pressure is a virtual non-issue. Because of this, the age limits placed on his TV, movie, and present preferences don’t necessarily jive with his chronological age. He’s loved Elmo, Raffi, and the Wiggles for years with little sign of moving on just yet. When it comes to toys, he enjoys ball-drop games, over-sized books, and almost anything with a screen. No Pokemon. No Minecraft. Just specific items that he’s chosen and we’ve learned about through trial and error. Most of these selections fall below his age-range but I know that’s okay. I can say that now, but it wasn’t always that way. It’s a difficult thing for a new special needs parent to wrap their head around as it seems to fly in the face of conventional parenting. In a world where kids are expected to expand their horizons, you can feel like you’re doing the wrong thing. How can I allow my school-aged child to still play with a toy designed for a toddler? Doesn’t that go against the very nature of my job? There’s nothing more frustrating than strolling down the toy aisle and thinking, “That toy would be perfect for my kindergartner!” Then, turning the box around and seeing a smiling infant’s image taunting you through the cardboard. Argh. Now I’m pretty sure that there aren’t too many parenting blogs that mention getting a sudden desire to fight a baby. So, I’m not going to say that. I’m sure the baby on the box is a fine upstanding individual. But, yeah. You could see how it might cross my mind. What that toy-model baby, with its smug little grin, doesn’t understand is that there really is no such thing as “age appropriate”. Whether you’re on or off the spectrum, you like what you like and nothing can really stop you. I remember the first time I put one of those ball-dropping toys together for Lucas’s birthday. Unsure if he would even like it yet, I assembled the pieces carefully and, once finished, pushed the ball in to give it a test run. I watched it fall down one slide and then the next before popping out from the bottom. As I silently lamented about the childish nature of my son’s new toy, I found myself putting another ball in and listening to the sounds it made as it rolled to the bottom. Before I knew it, I was pushing them all in at once. Then one right after the next. I was trying every combination and listening to the different sounds they made each time. The smiling box baby was loving this thing and so was I. At the time, I was in my late 30s, way beyond toddling age. Do you know why I loved it? Because that toy exists for all age ranges. Sure, the ball is replaced by a marble and the pieces are much smaller, but choking hazards aside, it’s the same exact thing. There are successful grownups with miniature versions of this infant toy on their corporate desks right now. Just like action figures for movies that came out 30 years ago and R-Rated Batman cartoons, these toys exist for a reason. Your age doesn’t dictate who you are. We can try to tell each other the opposite all day long, but it’s true. You can lecture your grandson about being too old to watch wrestling or play video games. You can beg your retired aunt to dress her age. You can marvel at how mature your niece is for a twelve year old. At the end of the day, though, none of it matters. They’re all going to be who they are no matter what. Your acceptance or lack of acceptance makes little difference. If it did, then it wasn’t who they truly were to begin with. This seems to be an accepted fact, for the most part, in 2017. We all applaud one another for being our true selves. We live in a world where grown men can go to conventions dressed like My Little Pony Characters. There’s no problem if your six year old wants to watch Sesame Street. Maybe they’ll grow up and move on to other interests. Maybe they won’t. That doesn’t matter in the moment. It’s a fact that every parent needs to be reminded of. Your job may be to help your child grow, but it’s also to make them happy. Teach and nurture every day, but remember to let them have the things they love as you do.